Giotto di Bondone, 1267-1337, was another of Italy’s famous artists in art history and a student of Duccio. While Duccio was more of a panel painter, di Bondone was a fresco painter possibly influenced by Cimabue's art and monumental figure forms. His best-preserved famous paintings are murals in the Arena Chapel, Padua, Italy, painted in 1305-06. The murals are scenes from the life of Christ arranged in a narrative sequence with the last mural being the Last Judgement. Giotto’s figures are simple, and solid. He paints strong figure groupings that take on even a greater three-dimensional existence when highlighted. While Duccio's point of view was one of distance, a birds-eye view of the subject matter, di Bondone chose a point of view closer to the picture plane, close enough to almost invite the viewer to step inside the artwork and interact with the figures. The feeling of intimacy with his figures also stems from the fact they were painted life size with more realistic artistic volume. The figures interacted with each other. They had greater emotions and facial expressions, setting a mood and atmosphere that was greater than Duccio's. In “Joachim Takes Refuge in the Wilderness”, a story in the life of the Virgin Mary, Joachim has been expelled from the temple judged not having children. He takes refuge among shepherds in the wilderness. Giotto’s artwork is a moment in time; an emotional drama where Joachim embarrassed humbly asks the shepherds for lodging. The story takes place on a frontal low-level plane with no directional light source or cast shadows. Di Bondone’s pictorial art space is limited having a flat background. He attempts recession into space placing trees, possibly symbolizing forests, behind a rock formation probably representing mountains. He also creates space placing sheep coming out of an architectural structure, and then places a mountain behind that structure. In another famous painting in art history”Vision of Anna”, Giotto places figures inside an architectural building displaying artistic three-dimensional space. The angel coming through the window is somewhat foreshortened, and to make sure the viewer understands his figures are in a building, despite it not having a front wall, He places a classical medallion on the pediment. Studying further, figure volume, figure interaction and three-dimensional space, in the Arena Chapel artwork, di Bondone painted “Meeting at the Gate”, using a Trecento an architectural structure convention. In order to tell a story at close range and in order to see all the important details, painters were willing to change the scale and size relationships of form as evidenced in this artwork. Giotto painted one of his most famous paintings in art history, “Enthroned Madonna”, in 1310. The throne has the feel of one point perspective creating a structure solidly planted in space. Di Bondone’s Madonna is solidly placed in space. Her form is more rounded, the fabric reveals a body underneath and her blouse realistically hangs on her shoulders and around her neck. Compare the three Enthroned Madonna’s of Cimabue, Duccio and Bondone, all famous artists of the Gothic Art period to see understand and see the advances made in artistic representation of Nature. 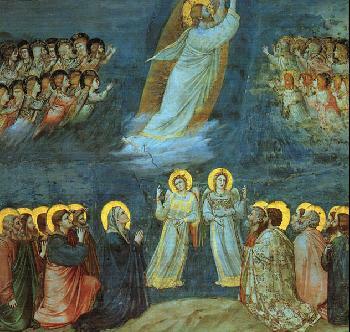 To view gallery 1, Giotto paintings, click here. To view gallery 2, hand painted reproductions, click here.